This third and last part of the hoof-blog-posts will be about the horse shoes and how we care for the hooves, and why in a general sense. Don’t know if it will add anything to what you already know, since my intentions are to make you confused enough to start question old dogma. Horses carried too heavy loads for too many hours a day so they got lame or simply wore out. In the beginning when the use of iron shoes was a new merging “high tech industry” it was probably rare and expensive, available to a few. The Farrier was the knight’s sword maker, blacksmith, horseman and physician in one; he was the rocket scientist at the time, the craft to drive a nail through a horse foot without resistance from the horse must have been as stunningly impressive as the sound of iron shod horses against stone laid streets. When the use of the iron horse shoe was fully implemented even horses with, less than average (not to use the word “bad”) hooves could be used almost unlimited. There was no longer a reason to hesitate to breed on a horse with poor hooves, if it was excellent otherwise. The thesis named “No Foot, No Horse” was published 1751 to emphasize the need for skilled farriers. The result is that today most horses are shod and to raise question about that medieval tradition is very controversial, surprisingly even more controversial than to question religious traditions from the same époque. Sadly the iron shoe puts restraints and limits on a physiological design it took nature 55 million years of natural selection to perfect. So how do you question an almost thousand year old profession with history, schools and certification systems? – Carefully? If a horse has sore feet from hard labor there must be different ways to solve the problem, right? In the best of worlds it is easy to do the right thing; don’t push or load the horse more than she can handle, take a rest or do as a working cowboy; alter between several horses. The medieval solution, which is still in use today, was to invent some kind of protection like an iron shoe, brilliant at the time, but would we solve the problem the same way if we faced the problem for the first time today? Do we see things differently today than a thousand years ago? There was a controversy; to do what is best for the horse or to do what it takes to win the war, to put food on the table, get the wagon up the hill, and so on. Today the controversy still exists, but it is spelled; economy. Many horses work hard as professional athletes, tourist guides, riding teachers etcetera; so the iron horse shoe is still valid? Even in a horse culture there is a limit where human interest goes before horse interest. What we can do is to push that limit as far to the horses’ side as possible; that should be our quest. A common reason for the use of horse shoes today is that hooves that work or compete under extreme conditions must be reinforced by a horse shoe to stand the additional pressure from the rider, the wagon, the unnatural surface and the long working hours. Also there are medical and corrective reasons to use horse shoes, by veterinarian justification. The business of horse shoes is an industry and there are the usual iron shoes in different sizes, shapes and thicknesses, aluminum shoes for gallop race horses, plastic shoes, and the handmade shoes forged by serious craftsmen. Clear the channels at the frogs side and the center channels with the knife, because dirt sticks easily to shod hooves. Clean the sole and cut of excessive growth, because shod hooves don’t wear properly. Clear the seat-of-corns, because stones and dirt get stuck in shod hooves. Trim the bars so they do not grow to close to the toe of the frog, because shod hooves don’t wear properly. The walls are cut and leveled and irregularities removed, because shod hooves don’t wear properly. Notice that up until now, what seems like important and necessary health care of the hooves actually is imposed by the use of horse shoes themselves, at a large extent. Reshaping the outside of the hoof with a rasp seriously weakens the hoof, good farriers agree on that opinion. Then comes the shoeing process; hot or cold. Hot means that you can forge the shoe exactly to fit the horse and also forge clips. By holding the hot shoe against the hoof you get an imprint to check that it fits and the walls can then be leveled exactly. The hot imprint is said to make a water resistant surface. Cold shoeing means you must cold forge the shoe, which usually is more inaccurate but faster. The nails (or clinches) should be set to come out even, turned over, cut of and hammered into a seat and smothered with a rasp. Small nails are preferred, being easier to draw out. The nails must be set right or the horse will be “quicked”, feels like a needle or stick under your nail, darn painful. It can happen even the best farrier at rare times. Winter shoeing includes chaulks/corks/studs , pads to cover the bottom of the hoof and even silicon filling of the whole bottom hoof capsule. 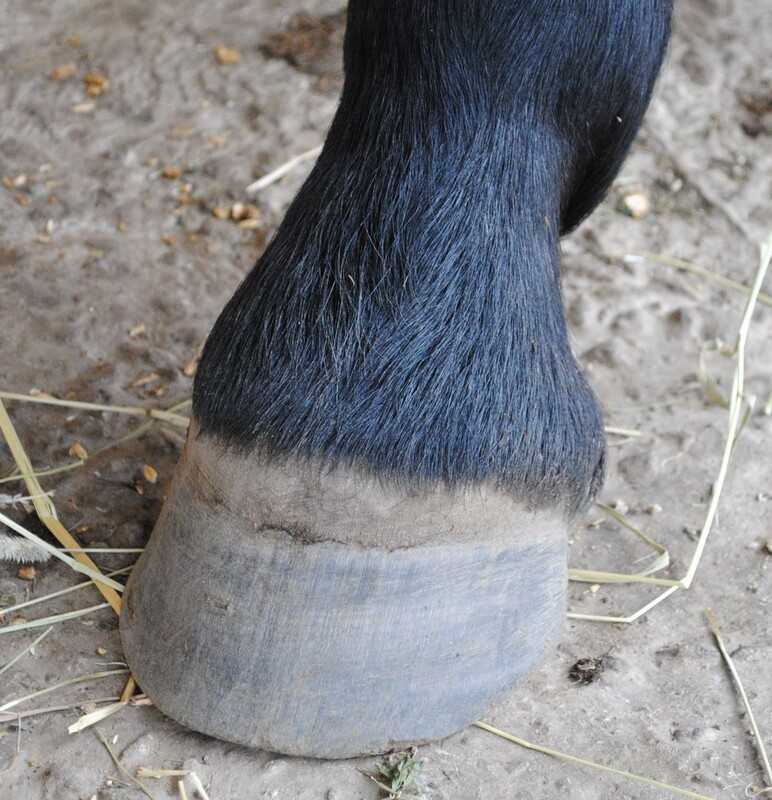 The walls of the hoof capsule may be reinforced by a horse shoe, but the other parts of the hoof system still has to stand the overload, which eventually may lead to injury and lameness, sometimes without the obvious connection to the use of horse shoes. Don’t get me wrong, I do not mistrust skilled farriers who truly are excellent professionals fully capable of their multitalented trade, it’s the ancient medieval values the profession is based upon that don’t convince me. Of course there are cases when corrective and medical reasons justify the use of horse shoes, but for a healthy horse there is usually no need for horse shoes at all if what’s best for the horse is set before our own interests. If the horse hooves need reinforcement to stand the pressure we demand, then it’s time to dismount and reconsider where we are heading! In sports there are always people willing to push the limits of their own health for the sake of competition, honor and success, or only to feel free and experience the thrill of life. People put horses in competitive sports for the same reasons and whether that is moral or not can be discussed. In one end there are the horses that seem to like the competition or at least they accept it, as they really are built to run and jump, in the other end are the horses that just stand useless in stalls or small confinements all day, all night. Life is dangerous by definition, eventually it will kill you. By the way yes, it is true that there are people living under worse conditions than some horses are, but does one bad thing justify another bad thing? What is morally acceptable in the use and care for horses and what is not? I have no answer to that and anyone who claims so is standing on a bogey trapped landmine. Instead of seeking the limit for what is acceptable, consider what is best for horses. Have the courage to come in second or third on a happy healthy horse, because that is what really matters by the end of the day. The text below applies on healthy horses with healthy hooves. Not all breeds can live outdoors all year and the available pastures may not always be large enough or of the right status. Bare that in mind as you continue to read. Contrary to the use of horse shoes are the many variants of barefoot trims concentrating on angles and hoof health trying to emulate the wild horse hoof, which is said to touch the ground on four points leaving the hoof wall off the ground. A barefoot trim differ from the usual shoeing process as the walls are left about 6 mm off the sole, the farrier goes easy on the sole and does not take too much off, and then he/she makes a round edge at the bottom edge of the walls to allow for an easy break-over (when the hoof lifts and tips forward ) and to prevent chipping and flaring of the wall edge. I’ve noticed in the short time we’ve had our Nokota horses that the edge of the wall is very strong and more often wears off, rather than breaks or chips off in large flakes. The edge stays relatively sharp and is not at all so rounded as the recommended barefoot trim. The wall sticks out a few millimeters under the sole evenly with the frog, so the wear and the growth of the hoof seems exactly balanced. Maybe the lower edge of the wall stays sharp for a reason; it is providing a better grip. 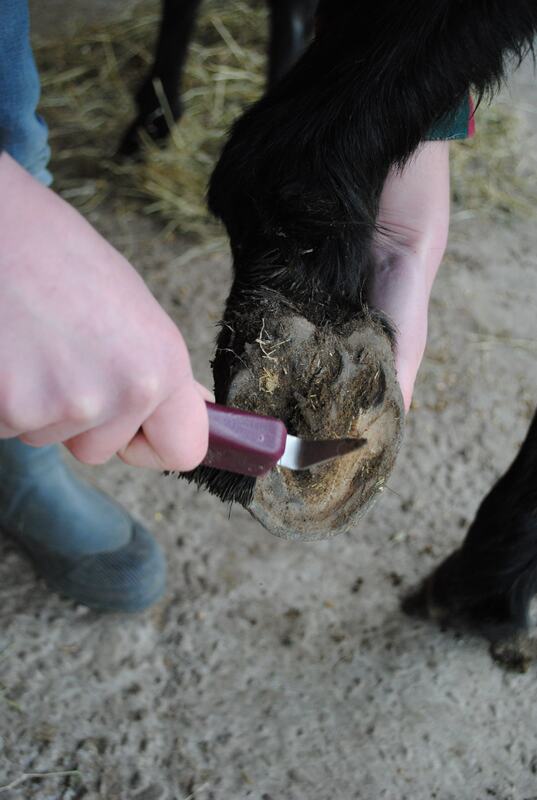 When the hoof is used as a tool when scratching the ground and on ice crusts in winter, a sharper edge is better. If a well rounded edge of the wall was necessary for the break-over, then the edge would naturally wear off, but it does not. It may depend on the prevailing ground surface; harder ground may result in a larger radius? Or maybe the well rounded edge is just for cosmetic reasons, to show off that this horse has been trimmed by a pro? 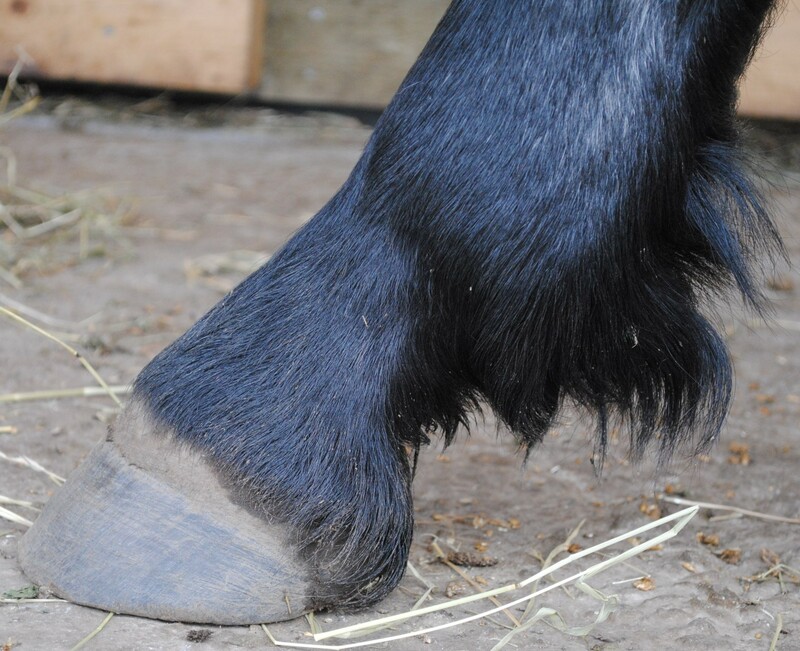 Some doubt can be raised about the term “barefoot trim” since it gives the impression that if you do not use horse shoes, you necessarily must “trim” or cut and alter the horse hoof. Switching from one business interest to another can’t be the only way to go. One possible alternative way would be to provide the right circumstances and environment in which the horse hoof can self-trim as in the wild, i.e. the right combination of ground surface, amount of activity and type of activity. A large low productive grass pasture is better than a small high productive pasture, if one has a choice. 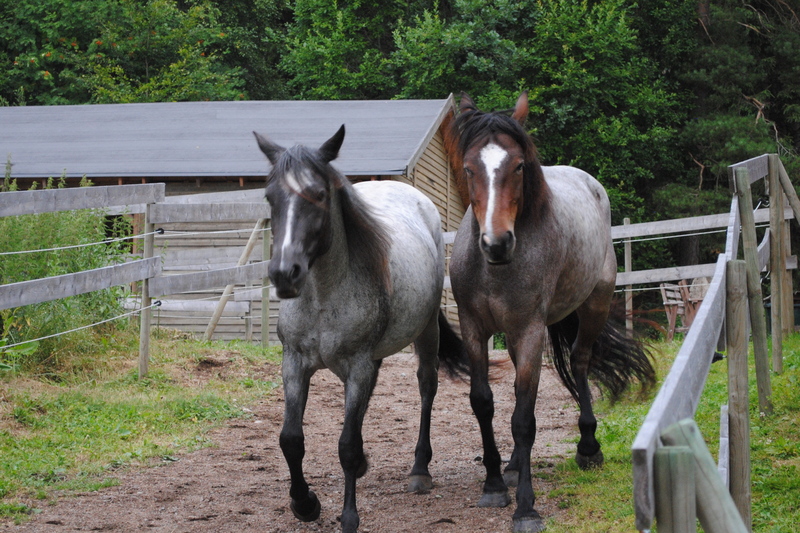 An area of sand with natural gravel pebbles like the one we have in front of our stable/shelter, as well as the concrete area on its front porch provides a good wear for the hooves. A piece of rough terrain with rocks, hills, streams, trees and logs is wanted for many reasons. 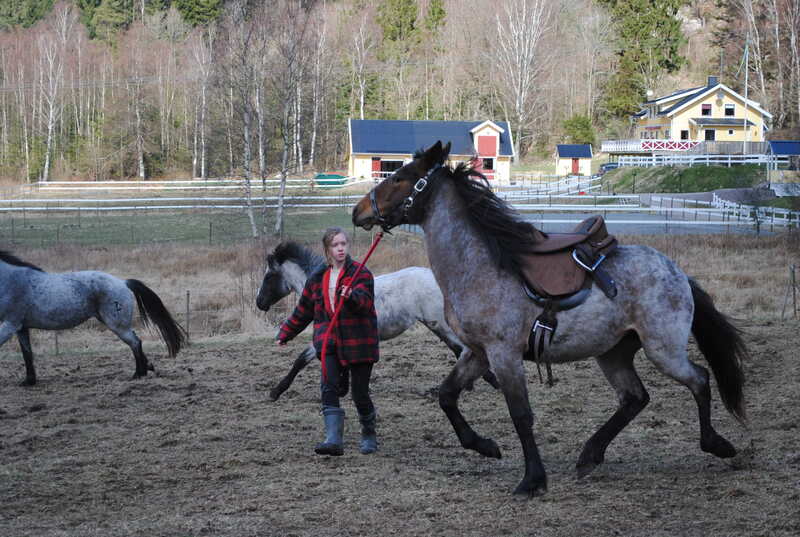 Combine horseback riding with turn out time to fit the present status of the hooves. 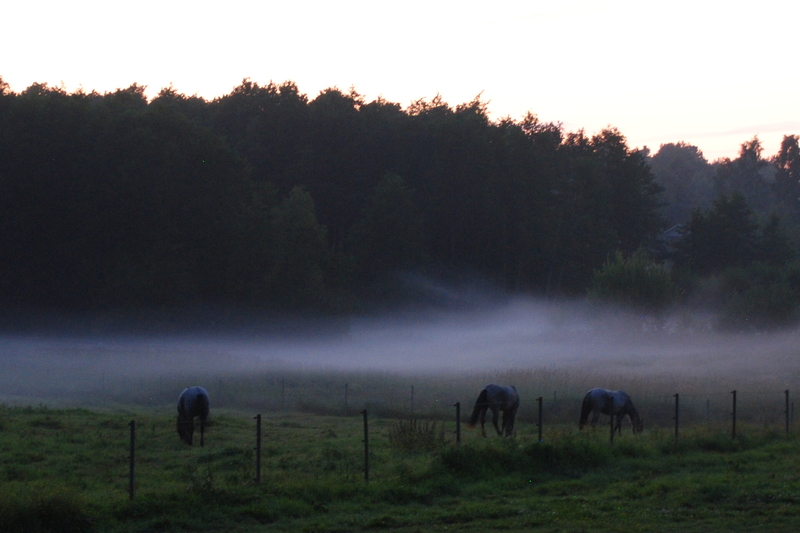 The single most important of all is to let horses live out in the open 24-7 all year around, free to move around in a herd. The natural wear of the hooves as the horses moves around makes a perfect hoof trim we’ll never be able to emulate artificially with a hoof knife or a rasp. To regularly check on the hooves is our responsibility. It’s not for the cleaning itself because the hooves will be dirty again after just a few strides, but lift and clean the hooves to look for changes, bruises and injuries, check the frog, clean the channels. 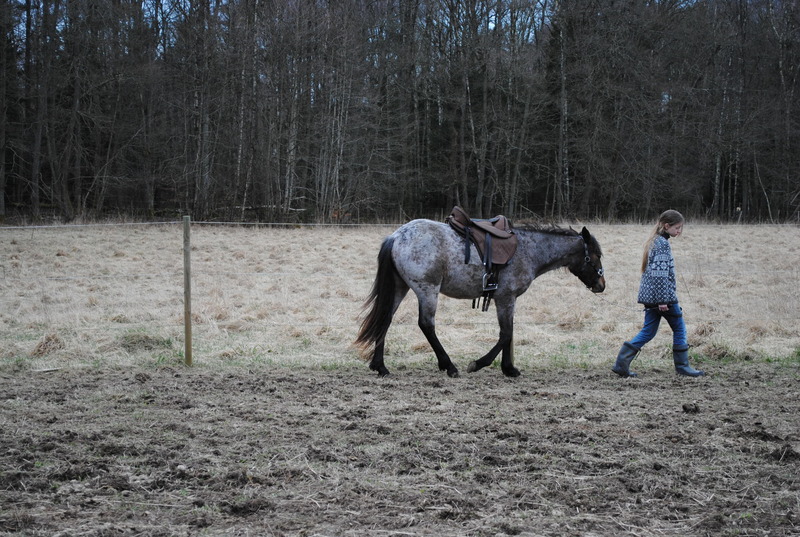 If the walls are too long the horse needs more activity on harder grounds, eventually consider to rasp the bottom of the walls, in small steps every now and then, rather than all at once. If the rim of the wall is flaked consider to trim and rasp it, but not more than necessary, use common sense. 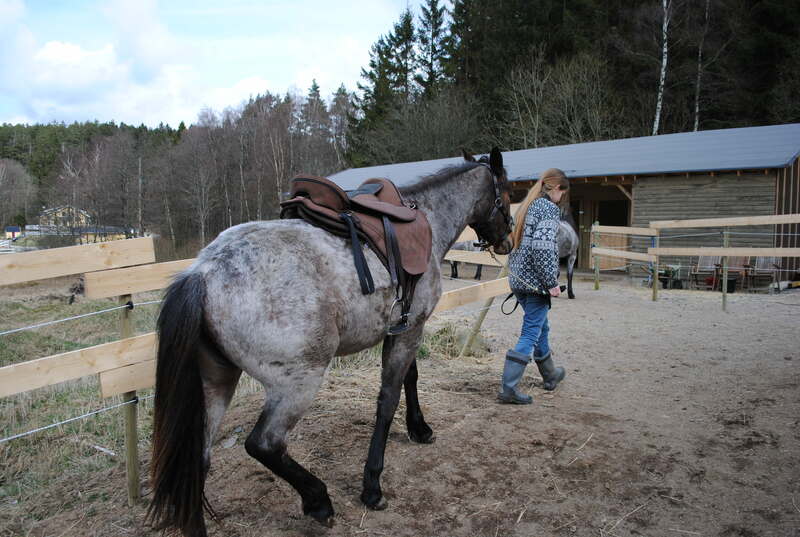 Some breeds of horses, like the Nokota, are well fitted for an outdoor life all year even in extremely cold climate. Our human tropical origin tricks us to believe that rainy and cold weather is terribly uncomfortable even for a horse; don’t trust your instincts in that issue. Provide an open wind/rain shelter with dry clean soft bedding and you have given the horses an option, though they will not always go inside when you expect it, it will at least still your own tropical conscience. To secure the survival of the horse we must find ways for the horse to be useful and to earn its living, but it is also important to let the horse be a horse, provide means for the horse to live a natural horse life with good unaltered hooves. We should not change the horse to fit our needs, instead we must adapt to the horse. Horses should be bred for their own needs, not ours. When we have learned to live in coexistence with wild natural horses the way they are, we can apply the same knowledge to the rest of the world around us. This is the second part of this horse hoof essay and now it’s time to describe how I recon the horse hoof is built and work, not from an experts point of view I must add, we are still learning. Looking at the horse hoof it is obvious that the walls of the hoof provides a protection for the sensitive internal tissues and they also give an extremely good grip in any terrain. As a solid mechanics engineer I can also conclude that the walls must be a refined elastic structure, an important link in a system of bones, joints, muscles and ligaments that dissipates kinetic energy as the hoof hits the ground. Fixating the walls with an iron horse shoe takes the walls out of that system, putting more stress on the other parts. Any changes made to the hoof may of course cause an increase of strain on joints, ligaments, and tendons all the way up to the shoulders and the hips. Research at SLU (Swedish Agricultural University) has shown that 65% of the kinetic energy is absorbed in the system between the walls and the coffin bone. The amount of kinetic energy a system can absorb is dependent on the mass and the speed of the object and thirdly the time it takes to stop it (which is dependent on the stopping distance). A horse hoof capsule can be compressed about 10mm, while a cars suspension is compressed about 100mm. Lets say a car weighs 3 times as much as a horse and that the horse hoof capsule absorbs 65% of the kinetic energy, while the cars suspension absorbs 100% it results in that the strain on the hoof is 2,18 times the strain on the car suspension, given all other factors equal. 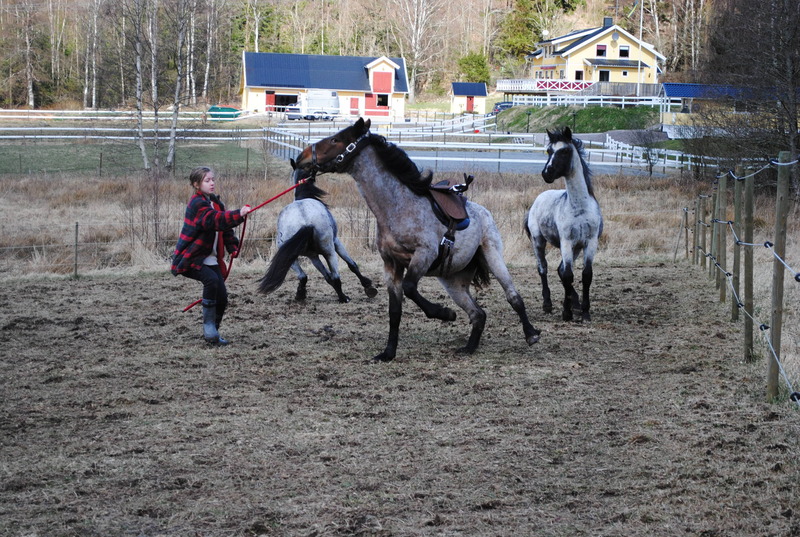 Note that the speed and frequency at which a stampeeding hores hoof hits the hard stony ground is widely more forceful and dynamic than what a cruising family car experiences on a smooth highway. Above all this is not a reason to justify the use of an iron horse shoe, it is a reason to think twice before altering a naturally perfected system. A four year old Nokota hoof, naturally perfect, still it has never been trimmed. Contrary to common belief a soft ground puts more total strain on the hoof and lower legs than a hard ground, especially for tendons and ligaments. The growth of the hoof capsule begins with mitotic activity in its deepest layer into the basal layer. As the cells matures and migrates slowly outward towards the surface proteins accumulate into their cytoplasm causing the cells to die and dry up into microscopic layers of keratin. The average mature hoof grows 6 to 9 mm per month, which means that a new hoof grows out during a year. The hooves of foals and yearlings grow 12-15mm per month. When a foal is young the hind hooves grow 12% faster than the front hooves, but by a year’s age there is no difference. Hooves grow faster in spring and slower in winter. Injury or infection in the hooves can cause rapid growth. It is believed that hoof quality is improved by proper balanced nutrition, still the best hooves grow on wild North Dakota prairie grass, not on neatly packed industrially produced and scientifically developed “Special Performance Horse Mix”. The walls of the hoof capsule are composed of three layers that grow downwards together. The pigmented layer is a hard protective surface and often breaks away in flakes at the bottom. The water line has a structural function, highly resistant to wear and its thickness increases towards the ground. The white line is the light softer inner layer of the wall. Because the wear of the hoof varies by the amount of movement and the nature of the terrain the walls will sometimes stick out from the sole in lack of sufficient wear, then a barefoot horse hoof will self trim by chipping off at the rim. The walls of a shod horse do not wear at all, so naturally they must be trimmed regularly. Cleaning the hooves of a Nokota filly less than a year old. The frog is a relatively hard rubber-like frog-shaped feature under the hoof that serves as a shock absorber and provides a good grip on slippery smooth surfaces, but most importantly it works as a pump, it actually pumps blood from the hoof back to the hearth! It’s good if the frog gets to wear and harden properly against the ground. If horses that stand inactivated in stables on urine acid impregnated bedding the frog may get infected and break down to a soft sore surface and totally loose its important functions. The more or less white sole covers underside of the hoof, except for the frog. The bright smooth surface has a hard consistency. 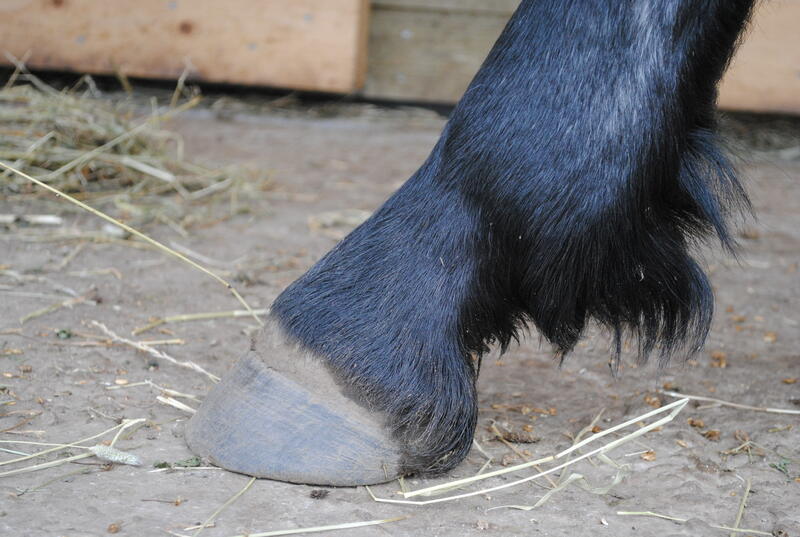 In shod hooves the sole may get brittle in lack of ground contact and the surface may rub off when scratching with a hoof pick. The bars are the parts of the walls that folds inward towards the frog at the heel at a sharp angle. The part of the sole that’s between the walls and the bars is called the seat of the corn. If the bars do not wear enough they bend towards the sole. The lowest bone inside the hoof has many names; the coffin bone, pedal bone or third phalanx (P3). It is covered by the hoof capsule and has a cup like shape that resembles the walls. Between the wall and the coffin bone is the corium which is the glue that connects the wall to the coffin bone, it’s called the laminae. Closest to the coffin bone is the sensitive laminar layer with nerves and blood supply. The inner wall has a similar, but insensitive, laminar layer that fits, and is strongly attached, to the coffin bones laminar layer. Inflammation such as laminitis can cause the hoof wall to pull away from the coffin bone. Over the rear part of the sole is the digital cushion, protecting the internal structures working like a shock absorber. 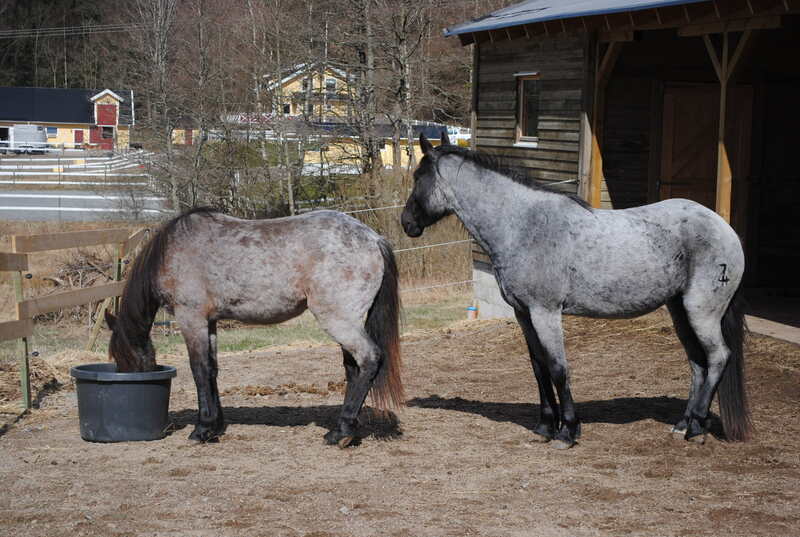 A foal has in general terms identical front and hind hooves, but as the horse matures they change shape and adapts to the variation in its use and the horse’s movement patterns. 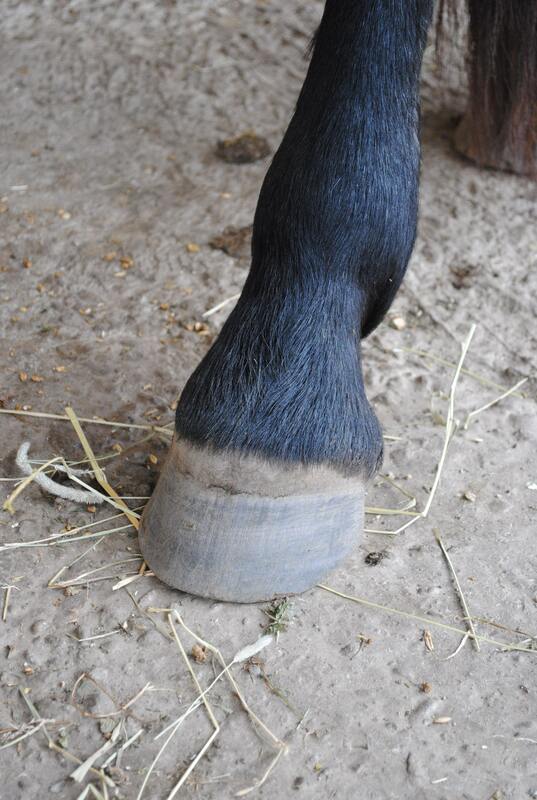 The hoof is a flexible system that changes shape as it is loaded. 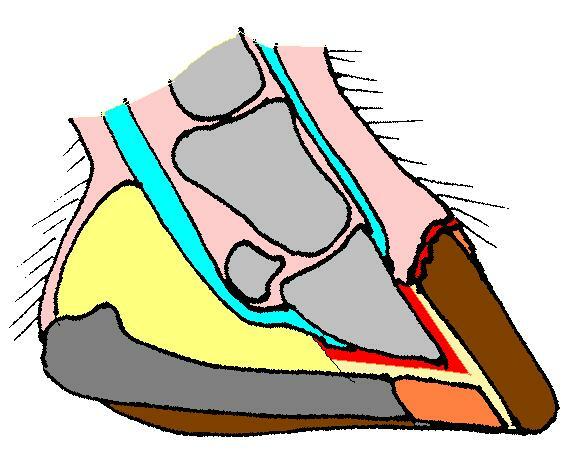 When a hoof touches the ground there is only contact at the heel and at the toe, as pressure is applied the lower wall edge, the sole, the bars and frog gets engaged, the plantar arch flattens, solar concavity decreases and heels spread, the hoof diameter increases, the coffin bone presses towards the hoof capsule. Blood pours into the corium and when the hoof is unloaded the hoof restores its shape and blood is squeezed up and as the flexion of the foot raises the blood pumps further up in the blood vessels giving life to the hoof system. It’s not very difficult to imagine that a fixed iron shoe will affect a refined system like this. Medieval ignorance may be forgiven, but what are the excuses in the 21st century? The next part will deal with the horse shoes, so stay tuned. As an old consultant engineer I will dedicate the following posts to one of the most fascinating mechanical designs I’ve ever come across, the horse hoof. Three Nokota horses were persuaded to jump over the big pond to settle down at our ranch about five months ago and for us this was a unique opportunity to learn straight “from the horse’s mouth” about wild unaltered horse hooves and how they differ from the usual domesticated hooves. It is often said, and the written sources are numerous, that the hooves of wild free roaming horses (or feral horses if you insist) like the Nokota horses, generally have enormous strength and hardiness, while domesticated horses has a more varied hoof quality, ranging from fair to catastrophic. 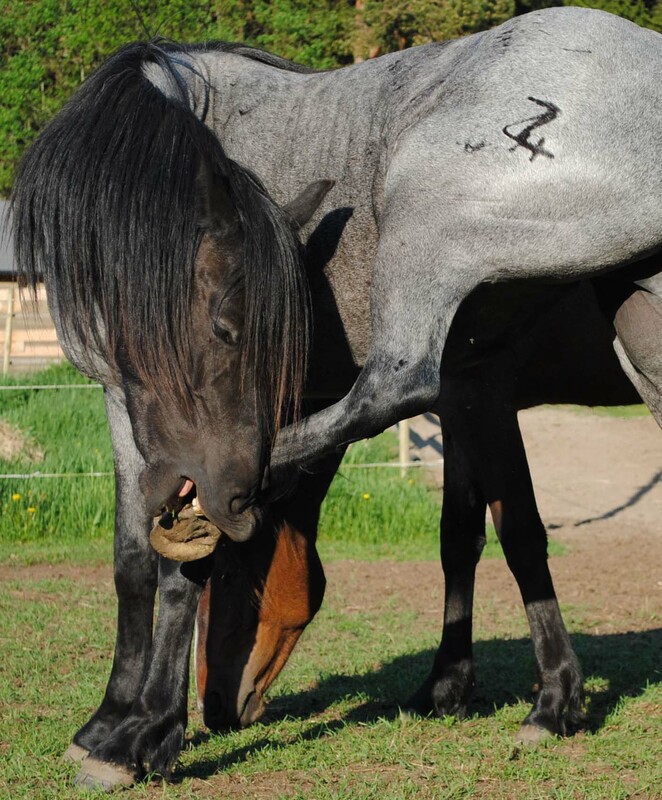 The hooves of a horse are one of the most perfected self adaptive systems in nature. 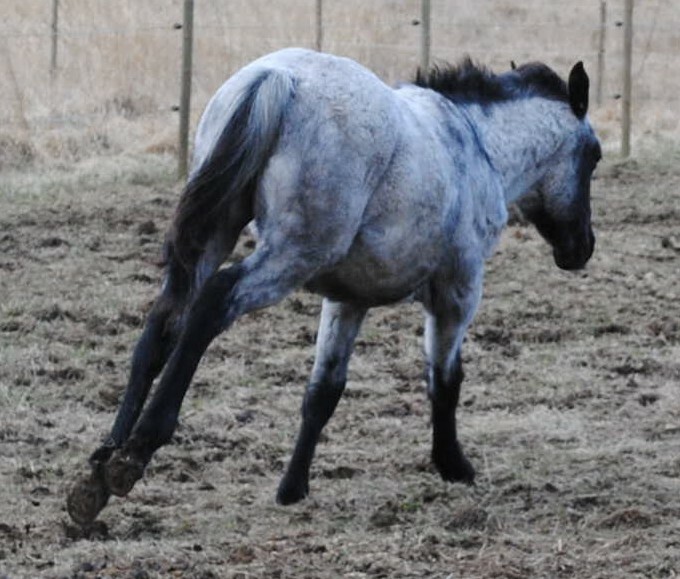 The competitive horse conformation, in which the hooves play an important role, allows an eight hundred pound body to accelerate quickly and move at high speed on any ground, to outrun predators like mountain lions and wolves. One good kick from a horse hoof can easily knock out any predator. A newborn horse runs alongside her mother protected by the herd just a few hours after birth. The intelligence of the horse also meets any environmental challenge. A horse can survive thru hard winters by using their hooves to paw through deep snow, crack up ice covered water holes and scratch off hard snow crusts to get to the grass underneath. A herd of horses can cover vast areas in search for food and water making it possible to survive in desert like terrain. The horse is likely the most successful species of all grass eaters. 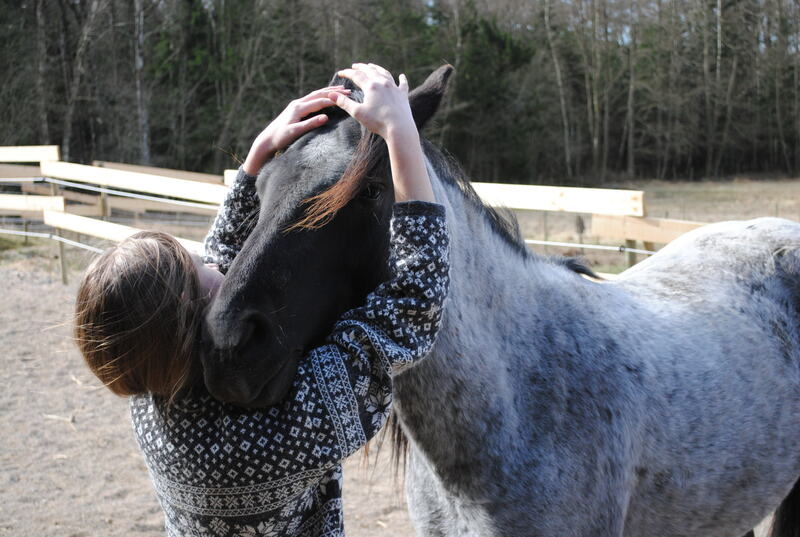 The only threat to the horse is Human, the dangerous one. Fortunately for the horse and for us some of our forerunners discovered that the horse could serve a better purpose than to fill our bellies, it’s probably the only reason horses still exists today. We still have a responsibility to fulfill. The advantages our own species has received from the horse have been one of the foremost reasons for human success, no one can honestly deny that. The inventive species has come up with more effective ways of transportation and the horse has been retired, reduced to a sporting equipment and a picturesque holiday amusement, but I have a nagging feeling that the horse once again has an important role to play for our future. The horse was much more than a mere means of transportation from A to B for the first horse cultures. Isn’t the exaggerated attention and care that we put into our cars an evidence of how much we miss the horse? Look, now I’m rambling again, this post is about the horse hoof so let’s get to the point; The hoof is much more than just the feet of a horse. Tomorrow I will post the more technical, or should I say biological, part of this horse hoof essay and describe how I recon the horse hoof is built and work, see y’all then!